Types Of Djembe Drums - Know Your Options Before You Buy! Know Your Options Before You Buy! Take your time! What you buy matters. There is more than one type of djembe for sale on the market. Learn about the differences first. After reading this, you'll be able to tell an African djembe from an imitation. There's no need for disappointing surprises after a purchase. These countries are home of experienced carvers, who whittle the shells out of a tree trunk by hand. Different types of tropical hardwoods are used, depending on what's available in the different regions. These woods contribute to the quality of the characteristic traditional sound. The shells are mounted with African goat skin. Goats in these countries are of a taller and sturdier nature than elsewhere and their skins have ideal sound qualities. Sometimes, just the shells and hides are imported and then mounted in Europe or North America with a rope of higher quality than those available in Africa. These authentic djembe drums can be rather expensive, but are a must if you are serious about making traditional African music. They are ideal for: professional players or ambitious hobby drummers. If well crafted these drums have the potential for professional djembes. Ghana djembes are famous for their decorative carvings and designs, which are often copied by manufacturers in Asia. Just like above instruments, they are completely hand-made of natural materials. But these are cheaper and generally less heavy to carry, because they are not made of hardwoods. Tweneboa (used for most Ghana djembes) is a softer wood. However, as a beginner or hobby drummer you are unlikely to notice a big difference in the sound. Owners of Ghana djembes usually love their roaring bass. drum circles, beginners and hobby players, schools, team building events etc. 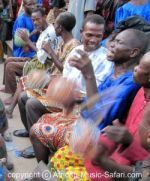 Among fans, you'll often hear disputes about the exact origin and djembe history, and therefore about which country the best ones come from. Fact is, that even the best materials and craftsmanship don't guarantee the "best" sound. Each of these countries produces "good" and "bad" drums. That's just in the nature of hand work: A craftsman doesn't know how a drum will sound until it's finished. Every drum is unique. So don't get lost in the opinions. Compare several drums and pick the one that gets you hooked. Your choice is a matter of your own preference, ambitions and budget. Remo is a manufacturer of percussion instruments in Valencia (CA), USA and has a type of djembe for sale that is ideal for hobby drummers. The Remo key tuned djembe is great for those who don't want to bother with the traditional rope system. The very lightweight and colorful fiber glass shells and hides of these drums are weather proof: You can play djembe outdoors without having to worry about possible damages. Meinl is a German manufacturer with subsidiaries in the USA. The Meinl djembe is a more classical version of a key-tuned djembe: It is made of rubber wood and goat skin. Some fiberglass shells are available as well. Do not confuse Meinl's rope-tuned instruments as African. Although they strongly remind of the typical Ghana designs, they were certainly not produced there. If you are interested in making African music, then ignore these drums. Apart from the shape and the name, they have nothing in common with the African instrument and are far removed from its culture and traditions. These may be good instruments, but they shouldn't be called "djembe" because that's not what they are, nor do they sound like it. For traditional African music only traditional instruments will do. However, if all you want is have some fun in a drum circle or make Western music, getting one of these is certainly an option. Be aware that lots of djembes found today are made in Indonesia or other Asian countries. Instead of at least adding some value, they mostly just produce copies of Ghanaian styles. Since these shells are machine-carved, they are easy to recognize. Western brands and retailers sell those drums, sometimes even labeling them "African" or "Pro Africa". That clearly misleads the customer. Never forget to ask a seller where his drums were made. Exploiting African culture is not only unethical but has terrible consequences on the continent: Many African products have suffered from cheap Asian imitations. Whole industries have been destroyed and hundreds of thousands of jobs are lost. Personally, I prefer to see African families benefit from their culture, rather than the big brands and imitators. But no matter how you decide, I hope you'll find an instrument that you'll love to play for a long time! By the way: You'll find more info on the djembe and other African drums and percussion instruments on this site. African percussion instruments are everywhere. But do you know their purpose? See them in action in their cultural context.